Japanese Prime Minister Shinzo Abe stated that he would work towards providing grants not loans anytime possible while giving assistance to the development progammes of Sri Lanka. He said this during the official meeting between the Japanese Prime Minister Shinzo Abe and President Maithripala Sirisena. The Japanese Prime Minister ensured President Sirisena that he would constantly provide assistance for the Sri Lankan infrastructure development. Discussions were held regarding the assistance provided by the Japanese government for the development of the Colombo- Trincomalee port. Japanese Prime Minister also stated that assistance will be provided for regenerating energy resources and would also contribute in developing the high way systems also. Japanese Prime Minster stated that assistance of special technical programmes of Japan could also be provided to Sri Lanka. A positive response was given to the appeal made by President Sirisena to provide technical equipment for the development of health sector in Sri Lanka. Japanese Prime Minister agreed upon giving assistance to disaster management programmes as well as waste disposal systems in Sri Lanka. Japanese Prime Minister who mentioned the assistance given by Japan in security and Navy activities stated that only Sri Lanka was fortunate to gain this assistance from Japan out of the countries in Indian Ocean. IMO, Japan is a better ally than India or China. Japan and its people have not forgotten Ceylon's defence of Japan at the treaty of San Francisco. SRI Lanka took more than $14.5 Billion as loan within 3-year since 2015, no development made yet, therefore, Hon Abe should be taking into consideration when given assistance to SRI LANKA where billions and billions of US Dollars have previously been taken by YAHAPALANAYA govt. seems gone with the wind or for which no records revealed to the public either. 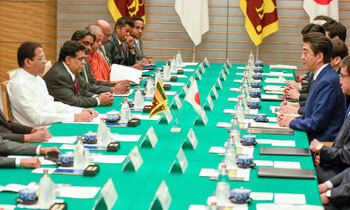 Japan have been providing loans, grants and every support to Sri Lanka since many decades. So are several other countries. But our politicians from both major parties wasted all those aids so far. Most effective aid to Sri Lanka by all friendly countries will be - to demand Sri Lankan politician to refrain from 'corruption and waste' otherwise no aids provided and those politicians are not welcome to their countries as government officials.